New Brunswick and London: Transaction Publishers, 2015. Daniel Pipes has collected some of his sharpest and most prescient writings from the quarter century 1989–2014. In them, he addresses a range of current topics, from the origins of the civil war in Syria to denying the Islamic factor in terrorism, to the way to resolve the Arab-Israeli conflict. Pipes pursues two themes in particular: the internal instability of Muslim-majority countries, in which nothing abides, and the expression of Muslim drive to apply Islamic law. Pipes' interests concentrate on the Middle East as understood from a historical point of view and on the role of Islam in politics. 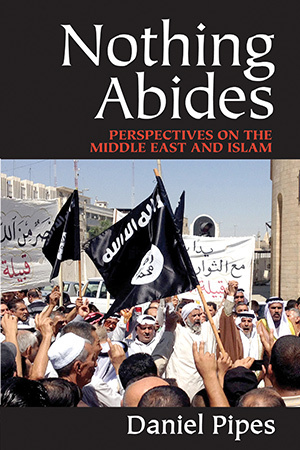 Divided into five thematic sections, this work addresses the Arab-Israeli conflict, Middle Eastern politics, Islam in modern life, Islam in the West, and individuals connected to American Islam. Pipes' deep knowledge, gained over forty-five years of study, combined with incisive writing and a well-regarded courage to speak out on controversial topics make Nothing Abides a compelling read for Middle East specialists, students, and the interested public. A "lucidly written and very lively book." "Daniel Pipes' most masterful of his many books and articles in his specialty, many commonly-held myths are exploded with extensive documentation. Nothing Abides is compelling like a bestseller and yet precise and scholarly."